Words matter. It would be surprising if I as a writer didn’t believe that to be true, since words are my entire stock in trade. Words have meaning. A shared understanding of the meaning of words is what allows us to communicate and function as a society. Words have shades of meaning, too—nuance—and understanding that nuance allows us all to send and receive exactly the message that’s intended. There are roughly 130,000 words in the English language. It’s said that Shakespeare had a working vocabulary of 54,000 words, which was not out of the ordinary for an educated man of his time. In comparison, modern Americans have a working vocabulary of about 3,000 words. As we continue to pare back our words, nuance is lost. Shades of meaning are jettisoned, the subtle distinctions sacrificed, pounded out into the blunt instrument of whatever fits into 140 characters. Words affect us. We may teach our children, “Sticks and stones may break my bones, but words will never hurt me,” as a lesson in resilience and the mature ability to walk away and elect not to engage, but we also know the power of words to hurt, as well as to heal. Certainly, we expect the leaders of our country, our shared community, to understand that fundamental truth and act accordingly. I’ve been thinking about this quite a bit in the last year, and wildly more so since early November. Because I knew that I would be posting this essay today, I selected a few books to read that seemed to cut to the heart of the things that keep me awake at night. It’s rare for a scholarly book of non-fiction to generate so much attention, but Paul Bloom hit a nerve with his 2016 book, Against Empathy: The Case for Rational Compassion. I know I did a double-take when I saw a quick synopsis of the book, which is basically that having empathy doesn’t make you a better person. Since I’m one of those people who believes that a lack of empathy leads us to parochial and isolationist views of the world, an us-against-them mentality that rarely leads to positive outcomes, I was intrigued to read his argument. He argues that for people who truly want to work toward a better world for all—and he’s a big proponent of that—relying on empathy is a bad plan. He also argues against the concept that empathy is an inherently moral attribute. Among its other poor qualities, empathy leads to tunnel vision and poor decision-making, and, frankly, it’s too exhausting to be sustainable. He does make a strong case for “rational compassion” as the better guide for long-term investment in the world and people around us. (And it turns out that I’m more of a “cognitive empathy” person anyway, and Bloom isn’t against that kind of empathy.) The point is to engage with your world in a thoughtful, informed way that allows you to sustain that engagement over the long haul. Next on my reading list was a completely serendipitous find, one that served as a companion piece to Bloom’s. Each Christmas, a friend of mine gives me a random book chosen because of its snarky or cynical title, knowing that it will speak to me. This year, he gave me a book the title of which is unprintable, but which neatly rhymes with glassbowls, so that’s how we’ll refer to it here. Author Aaron James is a philosopher with a PhD from Harvard and some pretty serious publications to his credit. Despite its edgy title and the fact that James was inspired to write this 2012 book based on his experiences in international surfing, Glassbowls is even more scholarly than Bloom’s book. The two authors quote many of the same people, such as cognitive scientist and linguist Steven Pinker, and reference the same research. In short, the glassbowl feels a moral justification for behaving as he does, so it’s easy for him to dismiss any bellyaching from the rabble. He’s the guy for whom the rules do not apply. Those rules are for the rest of us. The reason he makes the rest of us so angry is his staunch refusal on a moral level to recognize us as his equal. Because these guys constantly break accepted guidelines of cooperative social conduct, James explores what happens when we have an excess of glassbowls, all going around breaking the shared social contract and refusing to cooperate. It’s not good. Last is a book that has been on my To Be Read stack for close to two years. 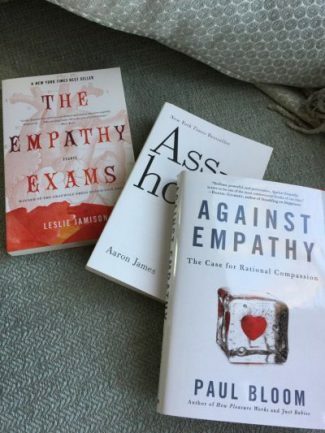 Quoted repeatedly in Bloom’s book, The Empathy Exams is Leslie Jamison’s 2014 collection of essays, and, like Against Empathy, was another unlikely bestseller. Jamison is well worth reading any time, but for me, I most appreciated the balance she brought as something of a counterpoint to Bloom. Jamison acknowledges that she isn’t always looking for empathy in her doctors; she needs a calm, reassuring practitioner when she is riddled with anxiety, and a focused trauma surgeon who can stop the bleeding without attempting to feel what she is feeling. But many of her wide-ranging topics—such as serving as the support person for a runner in an ultra extreme race that few complete, visiting an acquaintance in prison, and participating in the annual conference of a support group for an ailment the medical community doesn’t recognize—illustrate the value of pushing outside the bounds of our natural impulse toward self-absorption. Yes, words matter, but in this case—whether we call it empathy or rational compassion or simply a desire not to be a glassbowl—what matters is grasping in a substantive way that our experience of the world is not everyone else’s experience, and it’s worth our efforts to try to get a sense of, to comprehend, those other experiences. It expands our limited horizons, and strengthens what sometimes feels like a fragile social contract. Words do matter, though, and when they are used like weapons to demonize and diminish, to draw lines between us and them, we all lose something. Our social fabric unravels just that much more. I mentioned that Steven Pinker was quoted in two of these three books. Pinker is a words guy. He wrote The Language Instinct, Words and Rules, and The Stuff of Thought. His 2014 book is something of a “Strunk and White” for the 21st century, called The Sense of Style. When he signed a copy for me, I told him I was surprised he agreed that eager and anxious have become acceptably synonymous, since it’s impossible to separate anxious from its root in anxiety. From my perspective, that’s not just nuance, that’s a basic difference in definition. Today offers a perfect example. Today, 20 January 2017, many people are eager, and many other people are anxious. Today, no one could confuse the two.